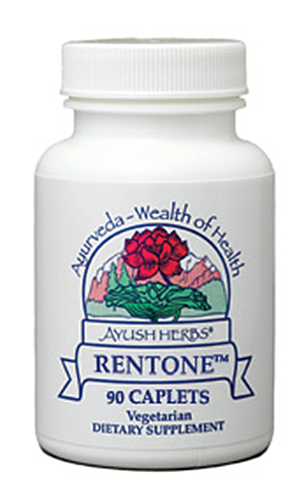 Ayush Herbs Carditone, Cardiovascular Support uses herbal ingredients to support heart and renal health as well as relief stress. Based on the history of Ayurveda medicine. Carditone is a combination of patented extractions of Rauwolfia, which has been used traditionally to support blood pressure levels already within the normal range and also has calming properties, and several other herbs and minerals. Terminalia arjuna is traditionally used as heart support; Tribulus terrestris and Boerhaavia diffusa are considered renal supportive; rose powder has calming effects; and magnesium supports cardiovascular health by helping to maintain healthy level of calcium and potassium. 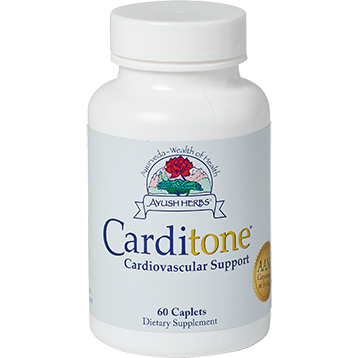 Based on the ancient medicines of India, Ayurvedic Medicine, Carditone contains herbal ingredients specifically chosen and combined to promote the best cardiovascular health. Ayurveda is one of the oldest medicine systems in the world and its long history has prompted recent medical studies on its benefits and use as an alternative to chemical based medicines.1 Biochemically, plant based supplements are more suitable for the human use as natural supplements are already structured in ways the body knows how to digest and make use of. Carditone uses this concept to provide herbs that work with the body to promote health instead of forcing any kinds of reations in the body as chemical based supplements would. Other Ingredients: Dicalcium phosphate, Stearic acid, Magnesium stearate, and Silcon dioxide. One (1) tablet one (1) time daily or as directed by your physician. Note: Contains Naturally Grown Himalayan Herbs, Free from Milk, Soy, Egg, and Wheat.